For years, I wondered who I am talking to. The Adoration Chapel heard all the deepest, most sincere, most significant prayers I said in life. And all those answered prayers were uttered without me knowing what’s on the other side of the glass. I can remember being doubtful if there’s really something there. Should I go inside? How to behave, with shoes on or without? Are there prayers or prerequisites before going inside? Why are there not so many people going in? But why are people going inside the adoration chapel even without Holy Mass ongoing? Why are the people there pray like their life depended on it? HOLY SACRAMENT inside the church of Brgy. 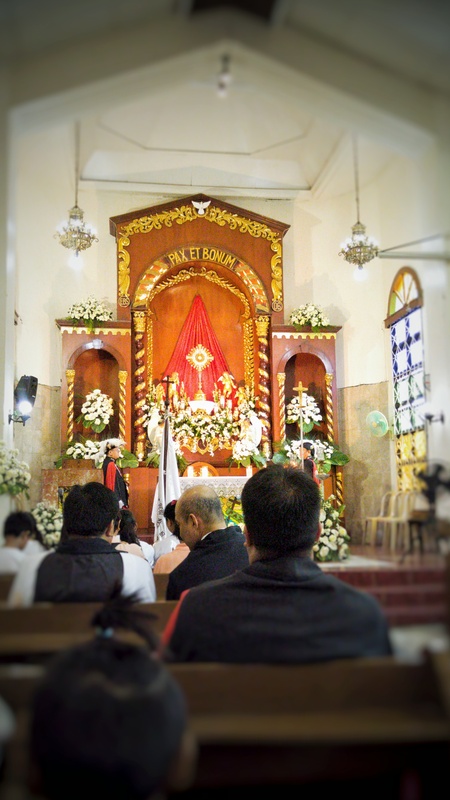 Atlag, Malolos, Bulacan where a “novernario” was also being held that time. Photo taken shortly before the procession started. Now, I serve on the Saturday, 7am Mass. This is the only ordinary schedule when I fit in because I’m 2 hours away from the Cathedral from Mondays-Fridays. After this, it’s when the Exposition of the Holy Sacrament is routinely done. It’s Him behind those glass! And it suddenly dawned on me why what I then called fate plays favorite on me when I “wish” in that place. It’s like a one-on-one session with Him. An exclusive interview that’s a two-seat distance where you could almost touch Him, almost see Him. What I know now are collaborations of various homilies, processions, catechism and reflections I hear and read. What I still don’t know are far greater that what has been revealed to me so far and I’m excited to find out. That excitement’s coupled with acceptance that I might exhaust this lifetime not knowing everything but I’ll still try. I’m gonna spend everyday walking that path to knowing Him in everything tangible and unseen. Anyway, this physical world we live in is not His kingdom. Earth is too small to contain all the might of his reign. Better look for Him with heart and eyes of faith instead of just physical eyes wide open. I spent months clueless on what is being sung during Exposition. Because I’m in a ministry now, the more I learn, the more I discover that there are tons more to learn. Song is in Latin and though I’m interested in learning Latin, it’s no easy feat. IT’S CLEAR NOW. The Holy Sacrament in one of the stations prepared during the Feast of Christ the King. 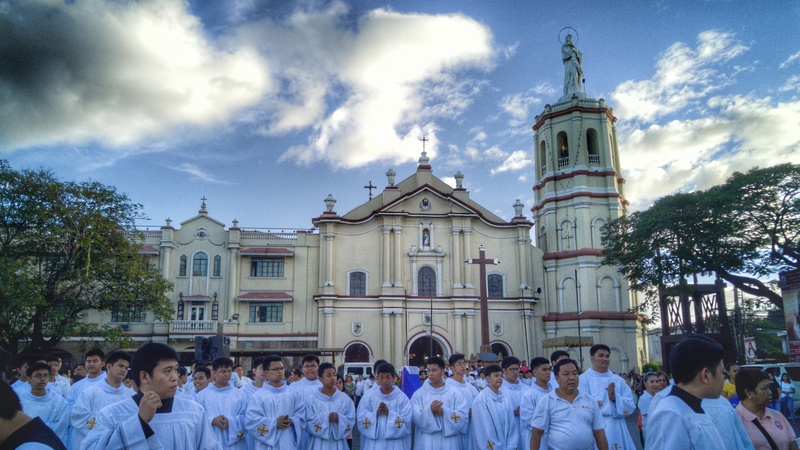 Photo taken on the Patio of Malolos Cathedral on November 22, 2015. The gate of heaven to all below. 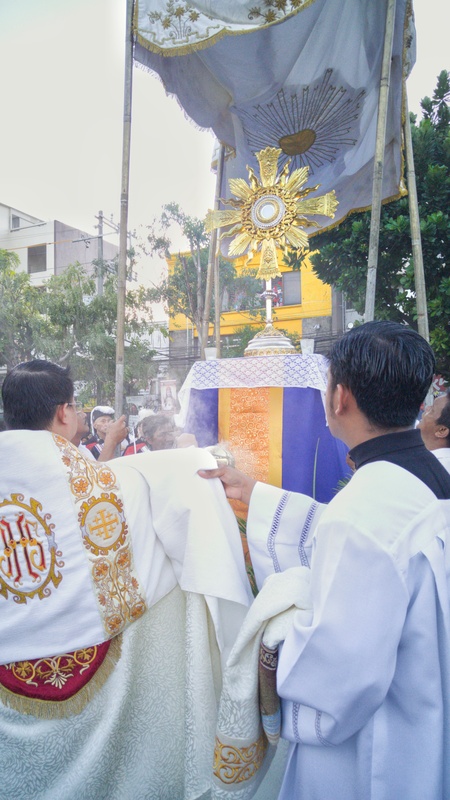 This year, I’m glad to have joined the procession for Corpus Christi and Christ the King, the two times we conduct procession not for the Holy Virgin Mary nor saints but for the Christ, the King Himself. Pray and hope we recognize His kingship and companionship as we walk the streets of life. Patio in front of Inmaculada Concepcion Basilica Minore of Malolos, Bulacan where different stations are waiting for the Holy Sacrament.